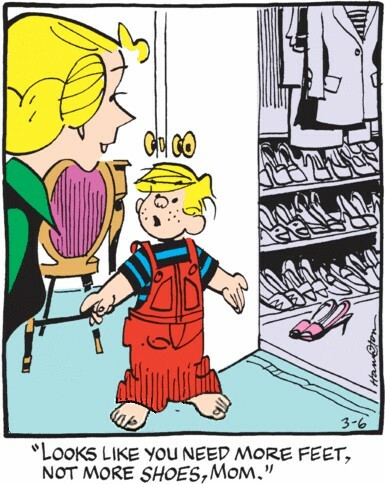 Here’s the (slightly edited) Dennis the Menace comic strip for March 6, 2014. “Fashion” is a hard force to overcome. This comic strip comes from Frank & Ernest. It appeared on July 9, 2014. Barefooters are used to folks with bogus liability fears. They forget the real liability issues associated with shoes (and not just glass slippers). Anyways, here it is, and I think it expresses a sentiment was can all agree with. Let me wrap up the trip that my son and I made out west. After leaving Great Basin National Park we headed straight home. We did make one short stop, though, at the Cahokia Mounds across the Mississippi from St. Louis. I’ll have one more post about this trip where I reflect on trying to do the whole thing barefoot and not really succeeding. Diamond Lil is a comic strip by Brett Koth. She’s an older, feisty woman who does not take fools lightly. This strip appeared on August 3, 2012. Being barefoot does improve the taste of beer, doesn’t it? I’m still working on writing up my visit Out West this past June. (I keep getting interrupted by having to do other things.) As you may recall, last time my son and I were in Great Basin National Park, and we’d hiked to the Rock Glacier and the Bristlecone Pine Grove on the side of Wheeler Peak. On June 27 it was time to ascend the peak itself.